This week we had our first signs of spring and at this time of year you have to grab the good days and get outside. We got back from school, Alice got changed out of her school uniform and we headed outside. Alice was excited to ride her scooter and Holly liked to mix it up a bit. Taking a go on her Toddlebike and then her scooter! When we looked to move house last year one of the things that we wanted, was a place that the girls could safely go on their scooters and bikes. Our new home gives us this. Since Christmas we’ve only had a couple of opportunities to get outside and it has been so much fun. To see Alice whizzing around on her scooter with a smile like a cheshire cat, that is what we wanted. 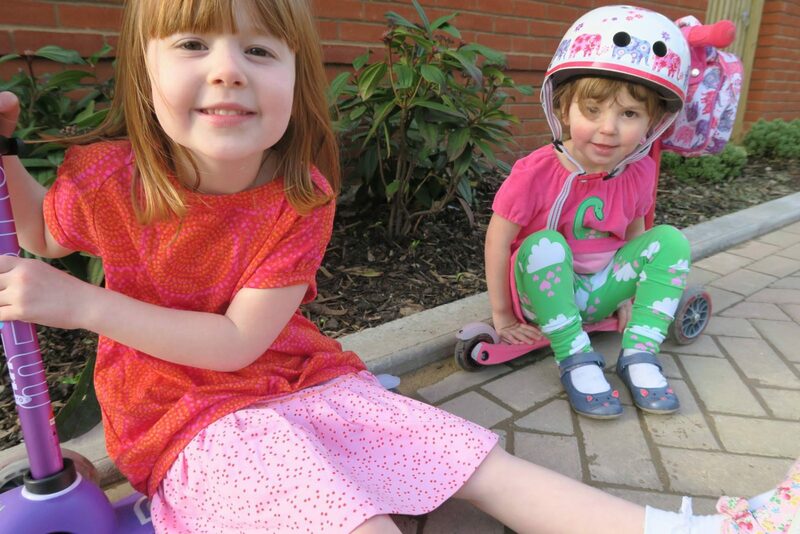 With spring in the air, it was chance for the girls to test run their new clothes from me&i, I don’t know about you but we are ready to ditch the tights and coats. Holly looked adorable in her raining heart leggings, the material was so soft and I love how vibrant they are. 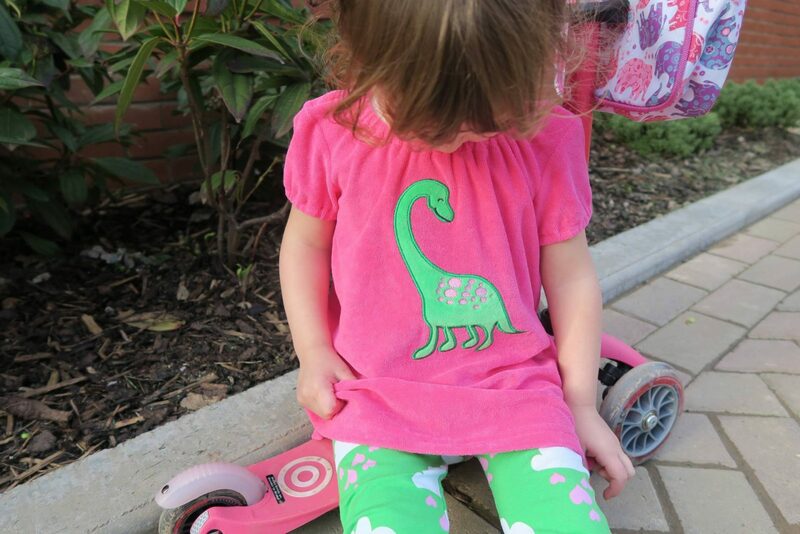 I teamed it with the dino short terrytunic and this was a big hit with Holly. She kept looking down at it and saying ‘dinosaur’, she is a cutie. 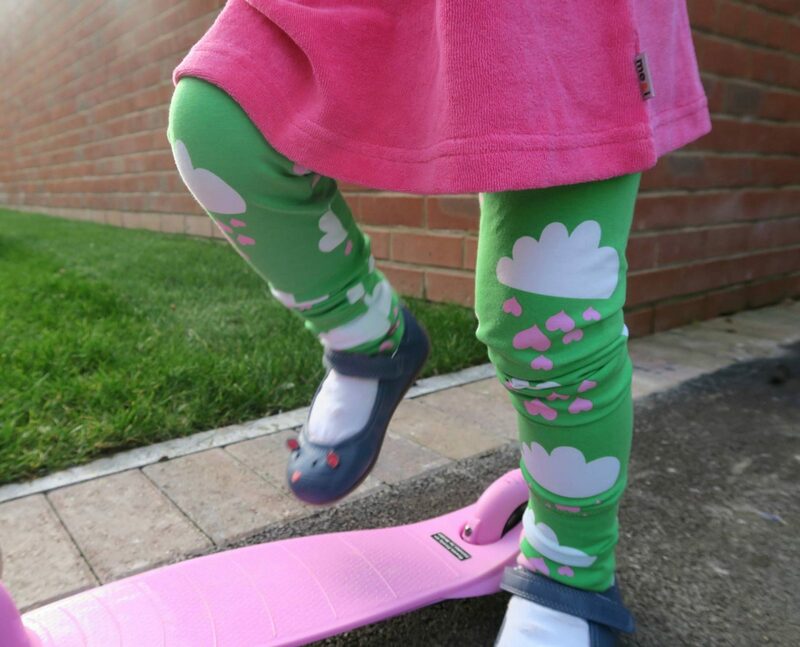 These clothes are so easy to wear, Holly can run, scoot and enjoy being a child without being restricted. 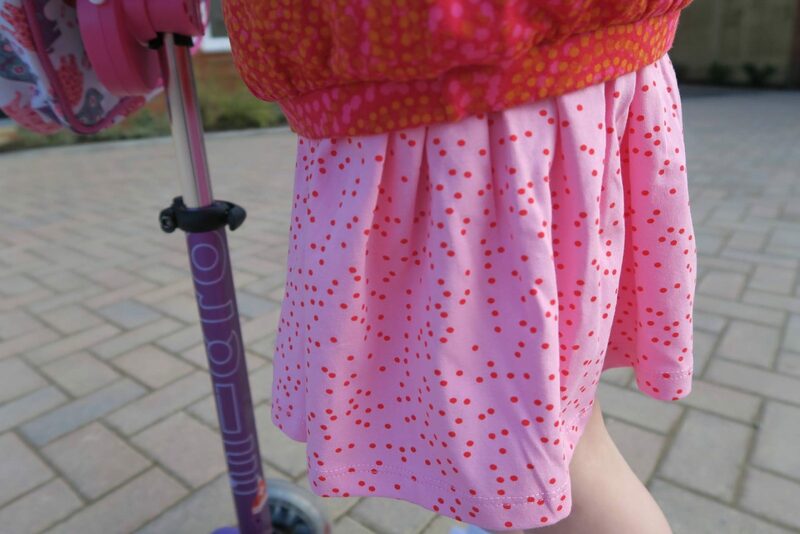 Her favourite colour is also pink, which made her outfit easy to choose when I saw this gorgeous pink dotty skirt. It’s really soft and just kind of floated on her. 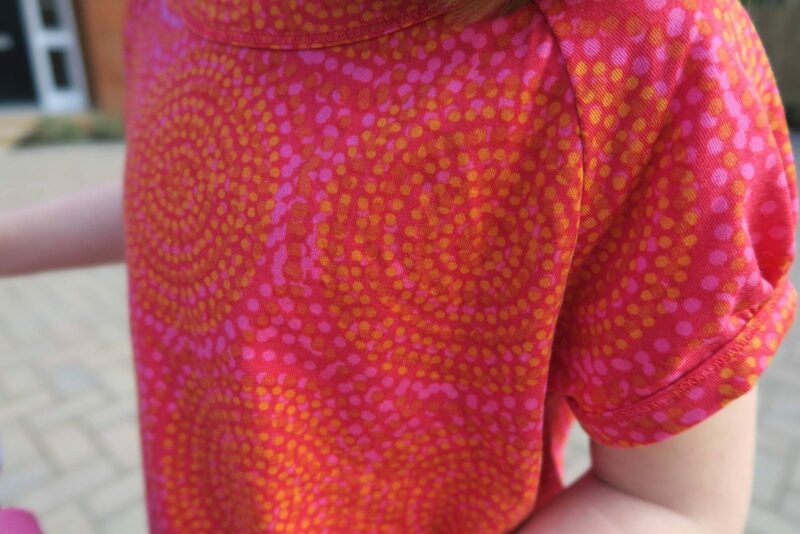 I teamed it with the circle dots puffy top, its not something that I would normally pick for Alice. I was worried that they might clash against each other, but I think they work really well together. Alice loved it and that is praise indeed! It was lovely to see the girls enjoying the sunshine together and get some fresh air. That period after school can be a difficult one to entertain them, but when we can get outside it makes such a difference. 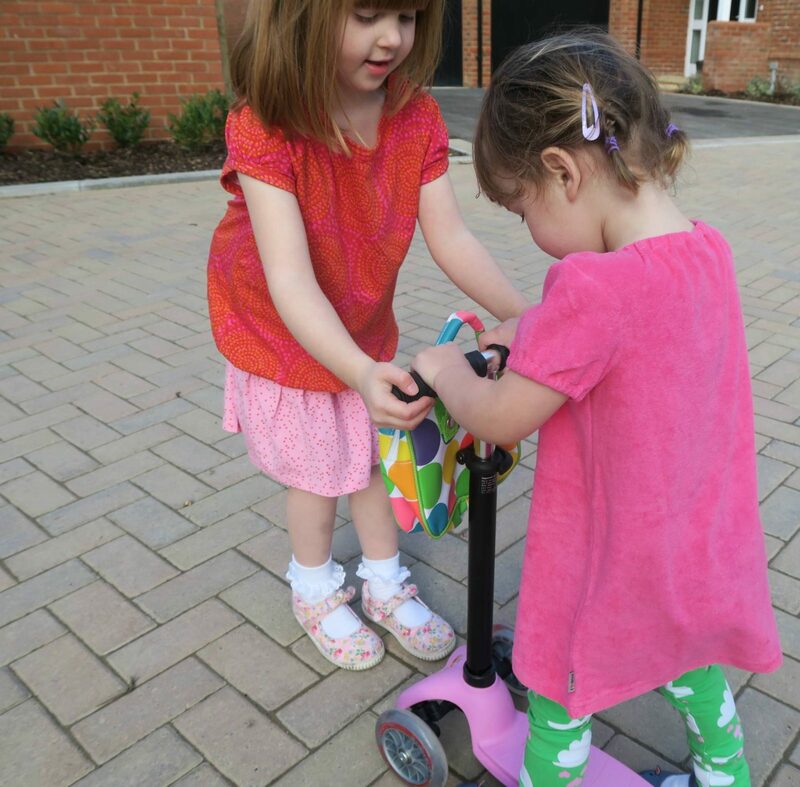 I loved to see Alice helping Holly on her scooter, she really is a great big sister. All we need now is for the sunshine to stick around and have more days like this. What I love about me&i is that they offer an opportunity for parents to become one of their consultants and work around their families. Not only giving them an opportunity to earn a living, but also a chance to meet other parents. You can find out more here. Disclosure: We were sent these clothes for the purpose of this post. All views and opinions are my own. Previous Post: « Easy Toddler Easter Craft…Hiding Bunny! Oh these are just gorgeous outfits. I’ve been following my local Me&I consultant on Instagram and they all look like lovely clothes. 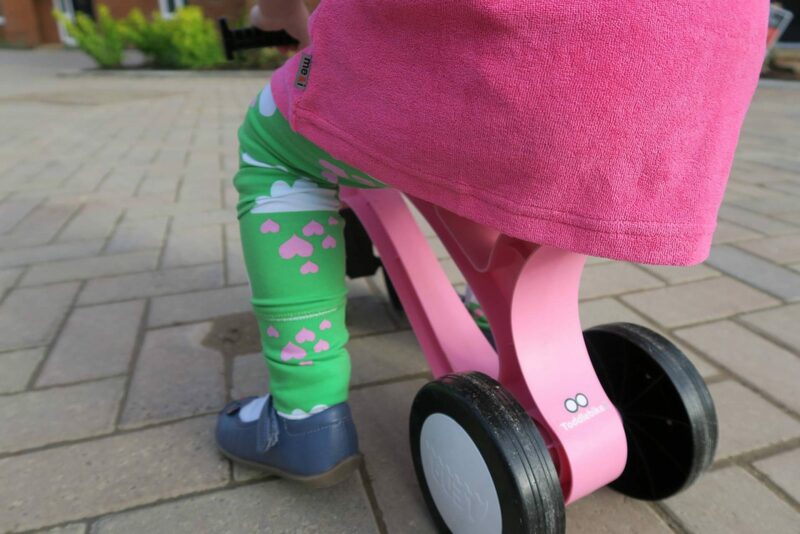 I love the vibrant colours of the clothes and those leggings are just far too cute. I haven’t heard of this brand before but I’ll definitely check them out. 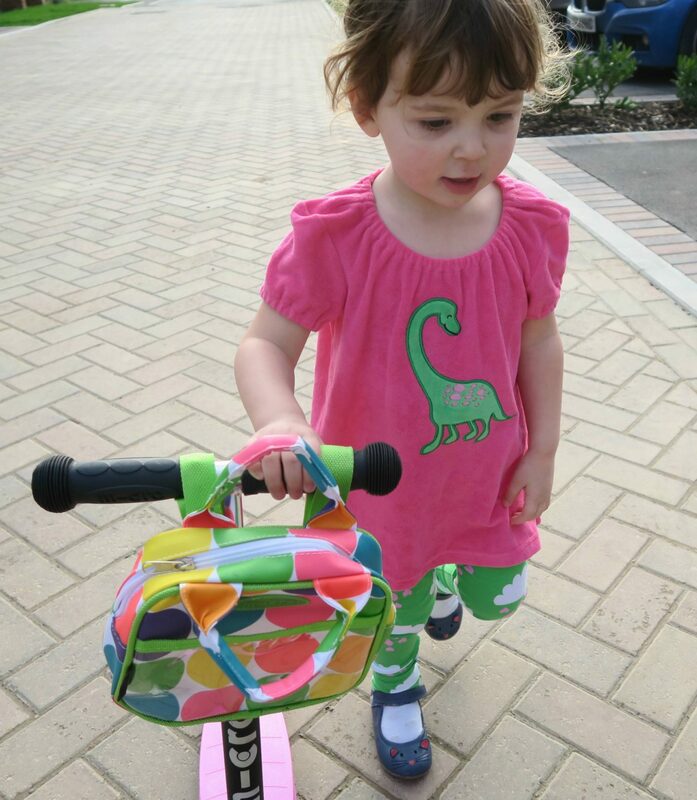 Love dressing my ladies in bright colours and unusual prints! These are really pretty, I love bright clothes and sometimes really struggle to find bright things for the boys. I agree I think that Alice’s top and skirt look lovely together my friends little girl won’t wear jeans either. I think my favourite has got to Holly leggings though. They are adorable. So glad you could get out after school it’s something I really miss.